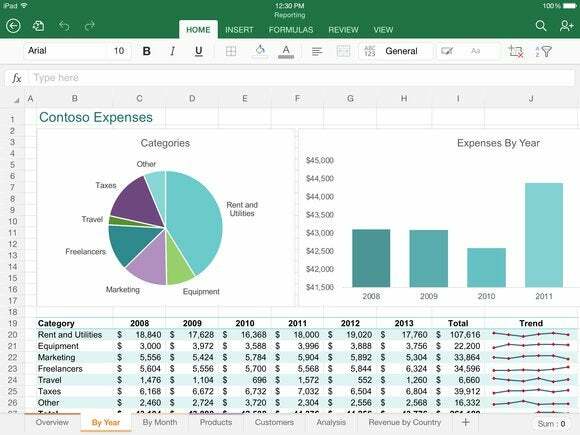 Back in April 2014, I wrote about the first release of Microsoft’s Excel for iPad, and I found it to have a well-designed UI and most of the features of the desktop version. It was missing some things, like the ability to print, but it was an impressive debut. The biggest issue, of course, was cost: You needed a $100 per year Office 365 subscription to create workbooks. 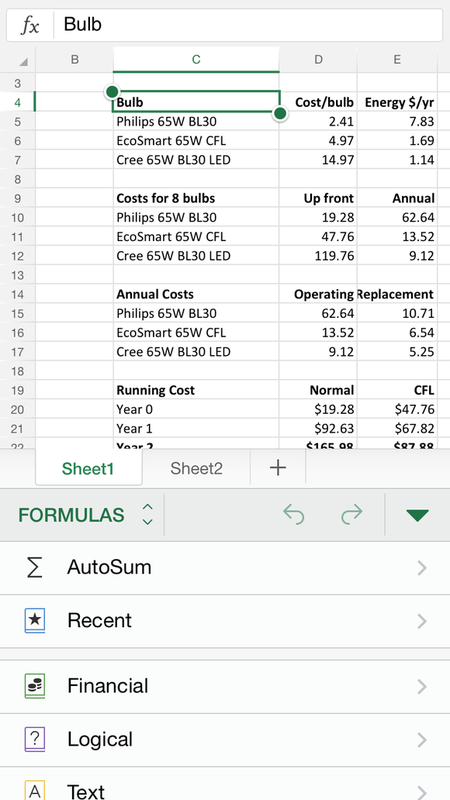 As of version 1.2, released in early November, that restriction has vanished: Excel for iOS can now be used to create spreadsheets, for no cost at all. The only caveat is that you must sign in using a free Microsoft account. If you don't have one, you can register directly from the app's home screen. The form isn't overly complicated, though Microsoft does require a birth date and telephone number. What I thought was a required gender pop-up thankfully offers a "not specified" option—there's no reason Microsoft needs to know one's gender. Once the account is created, you can log in and start using Excel. And you'll get nearly the same experience as those paying for Office 365. What can't you do with the free version? You can't customize pivot table styles and layouts (but you can't create pivot tables in Excel for iOS anyway); add custom colors to shapes; insert and edit WordArt; add shadows and reflection styles to pictures; and add or modify chart elements (you can add charts for free, but you can't customize them). But everything else I tried worked just fine. Creating, modifying, saving, printing… whatever the task, the free version never complained or cajoled me. I was able to see an upgrade box only when I went to modify a chart I had created; beyond that, the free version was functionally equivalent to the paid version I was using on another iPad. If you want the premium features, you can get them via Office 365 Personal (one computer, one tablet, one phone) for $7 per month, or Office 365 Home (up to five of each device type) for $10 per month. You'll also get one terabyte of OneDrive storage, which can be used both in Excel and as a general cloud storage drive. Dropbox is fully integrated into Excel, appearing next to OneDrive in Open and Save screens, as well as on the app's Account screen. 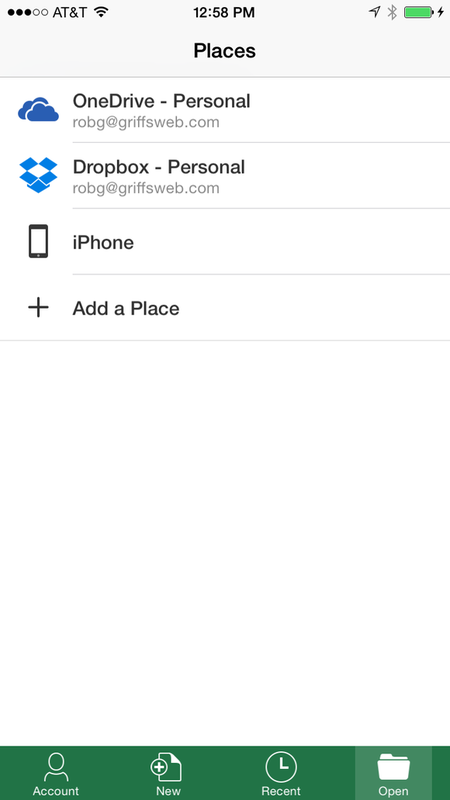 Dropbox integration seems first-rate; you login to your Dropbox account, and it then appears in the list of Places you can save and open things, right alongside OneDrive. I was able to open, modify, and save my Dropbox spreadsheets without any issues at all. The app is also universal, and has been optimized for smaller screens. While this is true, and Excel looks great on my iPhone 6, the reality is that it's still really hard to work on a spreadsheet on a phone-sized device. While I can see nearly as many cells on the iPhone as on my iPad—out to G and down to 33 on the iPad versus E and 32 on the iPhone—those cells are much smaller (and thus, harder to tap). Much of the iPhone's limited screen space is lost when working with the Ribbon. There's also no room for the ribbon on the iPhone's screen; to call up the ribbon, you must first tap an Edit icon, which opens an edit area that takes up about a third of the screen. From there, you tap another pop-up to select, for instance, Formulas, and then scroll through the formula browser. On the iPad, the ribbon is always visible, and choosing a ribbon item only loses one line of the display. In short, if you plan on doing much with your spreadsheets, you'll want to work with them on an iPad, not an iPhone. In my original review, it was noted that Excel for iPad lacked the ability to print; that was addressed in a prior update, and printing worked fine in my testing. You can also now edit unlocked cells on protected worksheets, which wasn't possible before. The other limitations noted in my original review still apply: You can see and delete comments but not create or edit them; you can't name cells or ranges, create conditional formatting rules, or enter array formulas. 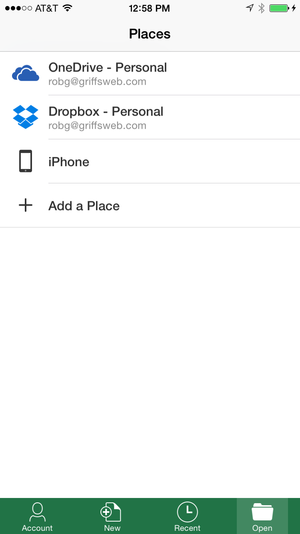 You can't insert images from OneDrive (or Dropbox), only from the iOS device's photos. As before, Excel is still a one-thing-at-a-time app—if you're working with two or more spreadsheets, you have to fully close one to open the other one. There are a few other areas of difference between the iOS, Mac, and Windows versions of Excel; if you open help in Excel for iOS, you can see a chart that lays out the differences between each platform. 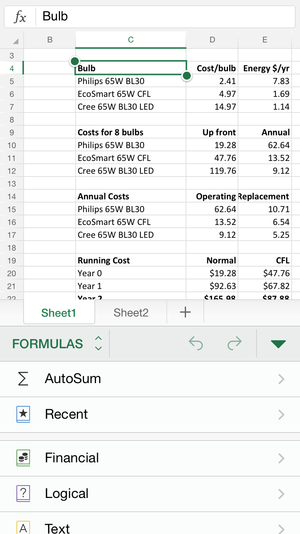 If you're looking for a powerful spreadsheet app for iOS that makes it seamless to work between a Mac, a Windows machine, and any number of iOS or Windows Phone devices, Excel for iOS is for you. Microsoft's new "free to create" pricing model, which requires only a free Microsoft account, means that Excel will be truly free for most users. Unless you're creating and editing graphs in Excel for iOS, you'll probably find that the free version meets your needs. Microsoft has really pulled a complete change of direction with this new version of Excel: The old version didn't let you really do anything without paying, while the new version lets you do nearly everything without paying. I'm not sure how well it will work out in the long run, but for now, it means you can get a great on-the-go spreadsheet app for nothing. Microsoft's new "free to create" pricing model, which requires only a free Microsoft account, means that Excel will be truly free for most users. Unless you're creating and editing graphs in Excel for iOS, you'll probably find that the free version meets your needs.